Lady Frankenstein has to be one of the most seriously underrated horror films of all time. In fact, it seems even that no one really knows about it, and it currently only has 175 votes on The Internet Movie Database, a 4.6 average. 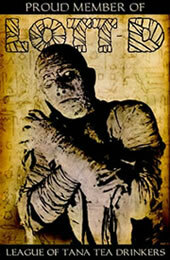 This is an excellent film, worthy of a place next to many of the better Frankenstein films. The first reel is a stylistic retelling of the traditional Frankenstein tale, only in this one, Baron Frankenstein has a slightly different fate. His daughter, in a marvelous performance by Sara Bay, is fresh out of medical school and is eager to follow in her father's footsteps. She concocts an even more twisted idea, complex and psychotic, in a move that makes her the real monster of this film. Equally outstanding is the stylistic atmosphere created by director Ernst R. von Theumer. 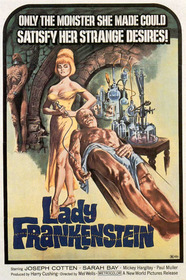 At the same time claustrophobic, eerie and gothic, Lady Frankenstein sets the ideal tone for a monster movie. The score, particularly in the first human transplant and reanimation sequence, is abstract, creepy and perfect. Although the score gets a bit sappy during a couple scenes in the last reel, it is excusable given the superb job composer Alessandro Alessandroni does elsewhere. At times, Lady Frankenstein displays a very subtle humor, and it has some similarities to Andy Warhol's Dracula -- not a bad film at all to resemble. The resemblance not only comes in the humor and in a certain way that the monster is dispatched, but also in look, pacing and other elements. Good performances abound here, and all of the characters are complex. In addition to Bay's excellent portrayal of Tania Frankenstein, both Paul Muller as Charles Marshall -- a friend of Baron Frankenstein's who is also deeply in love with Tania -- and Mickey Hartigay as the sassy Police Captain Harris -- who wants to hang quite a few of the townsfolk and who never seems to really believe anyone -- are outstanding. As much a tale about obsession, the insane things you'll do for love, the risks you'll take for money, the game we play with authorities and a complex morality play as a traditional Frankenstein picture, this movie deserves to be recognized. All genre fans should check Lady Frankenstein out. While it's low on gore and certainly not fast paced-action (most Frankenstein films aren't), it's a beautiful, complex, creepy movie. Worth searching beneath dusty counters in the bad part of town to find.